Glasgow is a vibrant bustling city with a wide variety of attractions and activities. This new approach will help make Glasgow a cleaner, greener and safer city whilst encouraging more visitors to spend time in the city centre. Waste permanently stored on our streets attracts vermin, causes litter and obstruction issues for people with mobility issues. Improving the appearance of our streets will benefit all who use them – and be good for businesses too. Where will I keep my waste outside the collection time? We don’t have any space for bins? Your business waste is your responsibility and will need to be stored within your property or on private land. Please speak to your trade waste contractor in the first instance. Some useful ways to manage this may include having your waste collected from within your business, increasing the frequency of collections, using collapsible bins or sharing bins with neighbouring businesses. There are also a number of trade waste collectors operating in Glasgow city centre that can help you explore the options available. But more frequent collections will cost me more money? Having waste collected more frequently may carry an increased cost; however recycling more may result in saving money. 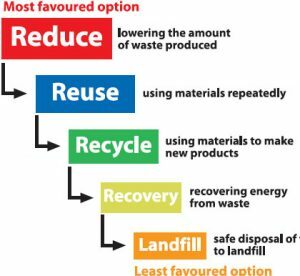 Waste (Scotland) Regulations require you to follow the waste hierarchy: By analysing the waste you produce and following the waste hierarchy you may lower the amount of waste you produce and the collections you therefore require. See Resource Efficient Scotland – Save Money on Waste. What happens if my trade waste contractor fails to pick up or is late? If for some reason, your trade waste contractor cannot collect your waste you will have to take it off the street and re-arrange collection. It is not acceptable to put out your waste and leave it when your business is closed; this is a failure in your duty of care. Can I place my glass waste in bags for uplift? No. Trade waste sacks/bags are not suitable for glass, which may get broken and burst the bag. Placing glass waste in bags is not acceptable due to the risk of injury to your staff, members of the public or trade waste contractor personnel. Please speak to your trade waste contractor to look at alternative options including smaller containers which can be stored on your property and/or the frequency of your uplifts. I keep my bins on my own property, will this affect me? No, if your bins are collected from within your premises or on your private land then these changes will not affect you. My bins are on a private lane, will this affect me? The Council is making these changes in accordance with various legislative provisions including the Roads (Scotland) Act 1984. Section 151 of the Roads (Scotland) Act 1984 defines a “road”. A road means any way over which there is a public right of passage. Therefore, if your bins are kept in a lane, which the public can pass through and this meets the statutory definition of a road, then you will still need to present your waste in allocated time slots. What will happen if I do not comply? We will work with you and your business as much as possible to help you comply with these changes. Should your trade waste be found on the street out with the allotted time slots, or for longer than one hour, enforcement action may be taken under the Environmental Protection Act 1990 which could lead to a fine of up to £1000. If you are concerned about not being compliant or want advice please do not hesitate to contact us, we are committed to helping and supporting you to improve the appearance of Glasgow. Has this been tested anywhere else? The City of Westminster, Manchester and Edinburgh have all successfully employed a similar system with a significant improvement to their appearance. See Edinburgh Trade Waste Case Studies. I have food waste, how can I store this indoors? Consider different ways of food waste disposal. This could include more frequent uplifts of smaller quantities of waste. Encourage a litter conscious attitude and code of conduct amongst staff at every level. Train new staff to follow these guidelines. Food waste and refuse must be removed from designated food storage and preparation areas regularly. Internal refuse stores must be away from food storage/handling areas. Food waste must be stored in closable rigid pest and leak proof containers within the premises. Food waste must not be allowed to accumulate or decompose. It should not be stockpiled for any more than 2 days. This time can be extended if refrigerated refuse stores are provided or if storage areas are very cold during the winter months. Areas used as refuse stores must be designed and managed in such a way as to enable them to be kept clean and free of animals and pests. Walls and floors must be washable/easy to clean. Carry out regular clean ups, including the rear of premises, car parks and delivery and storage areas. Waste cooking oil must be up-lifted by a SEPA approved carrier for recycling. It must not be poured down drains and must be kept separate from other food waste. Under Waste (Scotland) Regulations it is no longer permitted to discharge food waste to a public drain or a sewer by using, for example a macerator. Hand hygiene is essential when handling food waste. Staff must always wash their hands thoroughly after handling waste. ensuring the person doing the lifting has been trained to lift as safely as possible. The Council has changed its procedure for the way businesses put their trade waste containers out on public spaces. 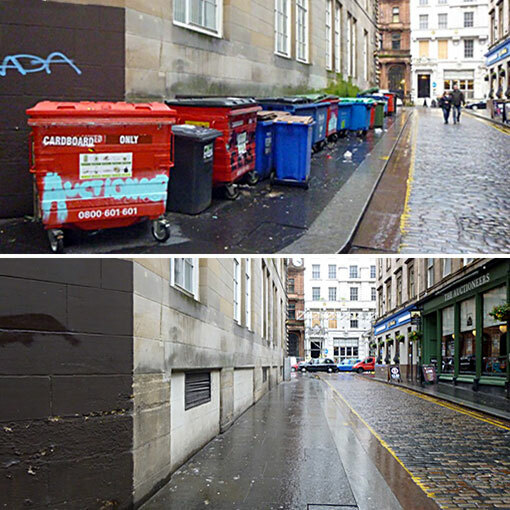 This has helped to make Glasgow City Centre a cleaner, greener and safer city. Trade waste is only be allowed on the streets at certain times of the day. This means you will need to store your business waste in your own premises or land and then put it out for collection during a pre-arranged time slot. Within these times, waste is only allowed to be put out for up to 1 hour. It is your responsibility to arrange when your waste will be collected with your waste contractor. If your waste remains uncollected, you should remove it from the street, store it on your premises and contact your waste contractor to rearrange collection. The attached maps outline each phase of the project roll out. If you store your bin(s) permanently on public space you must remove them as instructed and adhere to the new waste presentation system within the timescales outlined in each phase. Waste (Scotland) regulations: what is your duty of care? Rab Ha’s is a busy bar in the vibrant Merchant City area of Glasgow. Owner Robert Mullen knew that when the new trade waste rules came in he would need a service that was not only compliant but also worked for the bar. Changeworks Recycling Sales Manager, Katy Murdoch met with Robert and designed a bespoke recycling and waste management service for the bar. The new service means that the bar now easily recycles paper, cardboard, glass, cans, plastic and food. In this video case study Robert explains why he chose Changeworks Recycling and what further measures Rab Ha’s has taken to reduce waste. Case Study – Rab Ha’s from Changeworks Recycling on Vimeo.